One of the most important components of any flat roof is waterproofing. Flat roofs are more prone to water-related issues, including leaks and damage from pooling water. Waterproofing helps ensure that water stays out of the roof structure and the property. There are a number of components to a flat roof, including insulation. A flat roof typically has a minimal slope or pitch to allow water to drain. Despite this design, waterproofing is generally needed to prevent water from seeping into the structure of the roof or into the property itself. Flat roofs can be a cold or warm roof system. A cold roof features insulation under a deck between joists. Ventilation is used to prevent condensation from building up. In a warm roof system, insulation sits above the deck and below weatherproofing. With a warm roof, there is no need for ventilation since there is no risk of condensation forming. Bitumen is a popular waterproofing solution that is highly durable, often lasting ten to twenty years. This type of waterproofing is generally poured onto the roof. 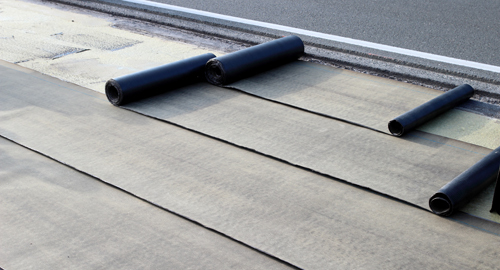 Felt is traditionally rolled over the heated bitumen to complete the waterproof layer. Alternatively, the underside can be heated with a propane torch as the bitumen is rolled out. Bitumen waterproofing is also available as a self-adhesive layer that can be applied directly onto the roof's surface. GRP or Glass Reinforced Plastic is a high performance waterproofing solution made from composite materials. A popular alternative to bitumen, felt and lead covers, GRP is strong and long lasting. GRP roofing systems are applied with a roller or brush, and no heat is required. Once applied, the waterproof cover hardens into an attractive, non-slip finish. Liquid waterproofing systems requires no flame or heat to apply. They are flexible and resistant to cracks, and prevent pooling of water. The water-resistant coating is applied with a roller or a brush. The product can also be sprayed onto the roof's surface. Since it has a low odour, no protective gear is needed when applying the coating. Single ply waterproofing is one of the most durable solutions, lasting between 15 and 25 years or more. The synthetic rubber ethylene propylene diene monomer or EPDM is often used in single ply waterproofing. The solution is low cost and durable, often lasting 30 years. Other plastics can also be used for waterproofing, PVC or vinyl layers. Asphalt is applied with heat before oxygen is blown on the surface. The type of roofing asphalt used will depend on the slope of the roof. Gravel is often used to reinforce the waterproofing layer. Over time, cracks can form on asphalt waterproofing. Installing asphalt roofing is often time consuming and energy intensive, making it a less energy efficient and environmentally sustainable option. Paints are a cost effective option for waterproofing a flat roof. Paints and other solutions are applied with a brush. Using paints for waterproofing is often a good maintenance or emergency solution. It can be used for repairing most types of waterproofing layers, including metal and asbestos based flat roofs. Paint can also be used as a sealant. Paint based waterproofing typically has a short lifespan of approximately five years. With the exception of paint waterproofing products, most waterproofing is durable and lasts between ten to twenty years. The type of waterproofing solution selected will often depend on cost. Liquid coatings are typically the most expensive options, followed by GRP roofing systems, single play and asphalt waterproofing. Paint waterproofing is the most affordable solution. Most waterproofing can be used for new builds as well as for replacing and retrofitting existing flat roofs. GRP waterproofing is typically best for new builds, while paints are generally used for renovations. GRP, liquid, asphalt and paint waterproofing are relatively easy to install, single ply waterproofing generally requires skilled tradesmen to fit. Single ply, bitumen, asphalt and paint based waterproofing products can be installed in adverse weather, while GRP and liquid waterproofing cannot. Whenever applying waterproofing on an existing roof, the materials must be compatible with the existing membrane. If the new product is not compatible, a primer may need to be applied first before the waterproofing is added. Before any waterproofing is applied, the roof must be cleaned properly and free from debris. The roof should also be completely dry before adding any waterproofing product. Consult the government's Competent Persons Register to find experienced and qualified contractors who can apply flat roof waterproofing. Individual manufacturers of flat roof waterproofing products also maintain registries of authorised installers. There are also a number of trade associations for waterproofing contractors, including the Liquid Roofing and Waterproofing Association and the Bitumen Waterproofing Association.